With 2017 and Canada’s 150th year-long birthday celebration merely days away, it’s time to look back at 2016 for a year in review. The past twelve months were busy with many issues directly impacting rural Ottawa. It was also a year for progress on several files and increased planning on many more. 2016 was a year of progress. More of Rideau-Goulbourn’s roads saw improvements with varying degrees of upgrades conducted on Bridge Street, Royal York Street, Ottawa Street, Moodie Drive, Mackey Road and Flewellyn Road. The village of Kars finally saw the end of construction on Rideau Valley Drive South and the end result was a main street that actually feels like a village main street. We reached a conclusion in our efforts to protect and promote Dickinson Square as a heritage district with the retention of the Carriage Shed and Dickinson House in City ownership. We also began construction on the new Remembrance Park on Dickinson Street, a beautiful addition to the Square. In North Gower, the Alfred Taylor Recreation Centre was the recipient of a new canteen building and new play equipment. 2016 was a year of controversy. City Council had many issues before it that were polarizing. In April, we brought forward a Vehicle-For-Hire By-Law creating a new policy in which ridesharing companies like Uber could legally operate within the City of Ottawa. At the same time, we loosened some of the regulations on the taxi industry recognizing the fact that, over the years, the industry had become over-regulated. In October, Council instituted a new Water, Sewer and Stormwater Rate Structure creating a system where the water and sewer rate budget can be managed in a more predictable manner with the aim of avoiding large rate hikes in the future. The new structure also balanced cost recovery of stormwater services across the City imposing a new fee on approximately 45,000 properties and lowering the fee on others. Earlier this month, Council approved an update to the Land Evaluation & Area Review which saw several changes to land designations, altering some from General Rural to Agricultural Resource Area and vice versa. Last, but not least this year, the City’s Public Library Board proposed a site for the future home of the Central Library. The new home is proposed to be at 557 Wellington Street, approximately 1.2 km west of the existing home at 120 Metcalfe. 2016 was also a year for community collaboration. The Remembrance Park became a reality thanks to the hard work of local residents and various community organizations, including the Manotick Legion. The preservation of Dickinson Square wouldn’t have been possible without Dickinson Square Heritage Management Inc., a group that represents over a dozen local organizations. The Manotick Arena Expansion is inching closer to construction thanks to groups like the Manotick Culture, Parks & Recreation Association. Community groups in Richmond have all come together to start planning the village’s bicentennial celebrations in 2018. Community organizations are what make our communities ever greater. My job would be impossible without them for which I am grateful. Whether it’s Burritt’s Rapids, Ashton, Fallowfield Village or any community in between, the countless local organizations work in partnership with my office, each other and the City to the benefit of all of us and that was never more obvious to me than in these past twelve months. I hope that everyone had a pleasant Christmas and I wish you all a Happy New Year. See you in 2017! As many of you may have noticed last week, the home at 5514 Manotick Main Street, known locally as the Falls House, was torn down. This was done so after much effort to avoid that exact scenario. Unfortunately, the home did not meet the criteria for heritage designation and the condition was deteriorating. Please visit rideaugoulbourn.ca/fallshouse for the full story on the property as well as next steps. On that page, you will also find panoramic pictures of each room in the house as well as a video tour of the home that I took a couple of weeks ago. This will give you the full picture of the home and all of the information that led us to this point. In recent weeks, I have spoken at length about the stormwater charge that was approved by the Environment Committee last week. It has been a difficult issue to deal with for everyone impacted. I predicted as much in May 2015 when the item first came to our attention and again when the public consultation kicked off in March of this year. My main focus the entire time has been the facts. Unfortunately, there is still a lot of misinformation out there on this subject. If you still have questions about this, please do not hesitate to contact me. We also have information available on this website (click here) that provides all of the background. There are, however, just a few points that I want to reiterate as they keep coming up in emails that I have been receiving and comments on various radio shows and whatnot. First, this has absolutely nothing to do with whether or not you flush your toilet into a sewer system or a septic system. Stormwater is completely unrelated from sewerage services. They were in separate budgets prior to amalgamation and that never should have changed. As I mentioned last week, Council made that decision to put them together in 2001 and it was the wrong one. I have also heard comments that this is a “tax grab” to increase revenues for the City. I completely understand that point because, for many of us in the rural area, we will begin to pay an extra charge on our tax bill. However, as I have also mentioned previously, those who are already paying for stormwater on their sewer bill will see a modest reduction in their bill. Therefore, these two changes will offset each other. The City spends approximately $42M city-wide on stormwater maintenance and that budget will remain at that number. With the two offsetting numbers, there will be no increase in revenues as a result of the stormwater charge. The final clarification I wanted to make is in response to comments that the revenue from this charge will just go toward urban projects that will not benefit the rural area. It will not. As mentioned above, the amount collected is just being shifted from water and sewer ratepayers to taxpayers. All fees collected in the rural area will go toward maintenance in the rural area. In fact, the City spends $8M annually in the rural area and the new fee will collect $2M. None of your stormwater taxes will service anyone but rural residents. I hope this helps provide further clarity. As always, I am available to chat about this further. We also spend time at each of our town hall meetings discussing this very issue. Our Manotick meeting is on November 15th and our Kars meeting is on November 23rd. If you are interested in a fun, interactive session of dance, laughter & music, come to the Manotick United Church on Friday, November 4th and join the Ever Hopeful Stringband and caller Pippa Hall for a family-friendly, alcohol-free evening of community dancing, including circles, squares and contras. Each dance is taught and the whole family is invited. The event runs from 7:00pm until 9:30pm and begins with simple dances, followed by dances that build on skills as the evening progresses. The cost to attend is $10 for adults, $5 for ages 12-18 and children under 12 are free. There is, however, a family maximum charge of $20. For more information call 613-692-4576 or visit http://dance.manotick.net. The 2011 Annual Drinking Water System reports confirm that Ottawa delivers safe drinking water that exceeds all expectations for meeting provincial standards and federal guidelines. These Ontario Ministry Environment reports, including those for Carp, Munster, Richmond (Kings Park), Greely (Shadow Ridge) and Vars, are now posted online at ottawa.ca. 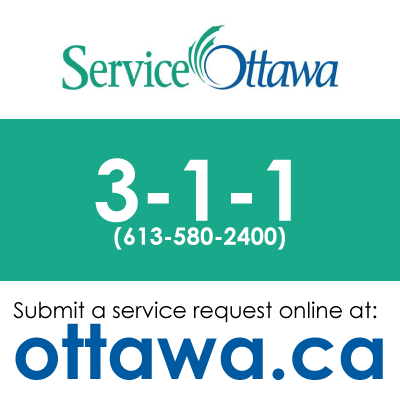 They summarize water quality testing results for 2011 for all drinking water systems in Ottawa and include information such as the description of the water system and test results for each water quality parameter.